With 2 boys aged 2 & 3, I am acutely aware of the food choices I make every day. Whilst the argument still rages on about whether whether being overweight/obese is genetic, what is for sure is that as a parent, our children learns things from us every day. I believe that if they see us, as a role model, enjoying freshly prepared food most days, this will have a bearing on their eating in the future. I have always avoided giving my boys ice-cream, feeling there was no need for it. With the weather already heating up in Sydney, I decided to make them a very simple, delicious, fruit-based ‘treat’ to enjoy on a hot day. They particularly love the pieces of fruit in the ice-pops. I use a Zoku, given to me by one of my lovely friends of over 20 years. I am already starting to enjoy experimenting with flavour combinations. 1.Slide a kiwi slice into the pop maker, keeping in mind that it freezes once it hits the edge. It’s harder than it sounds! 3. leave the pops to freeze for about 10 mins, then pull them out & enjoy; or pull them out & store in tupperware containers in the freezer. 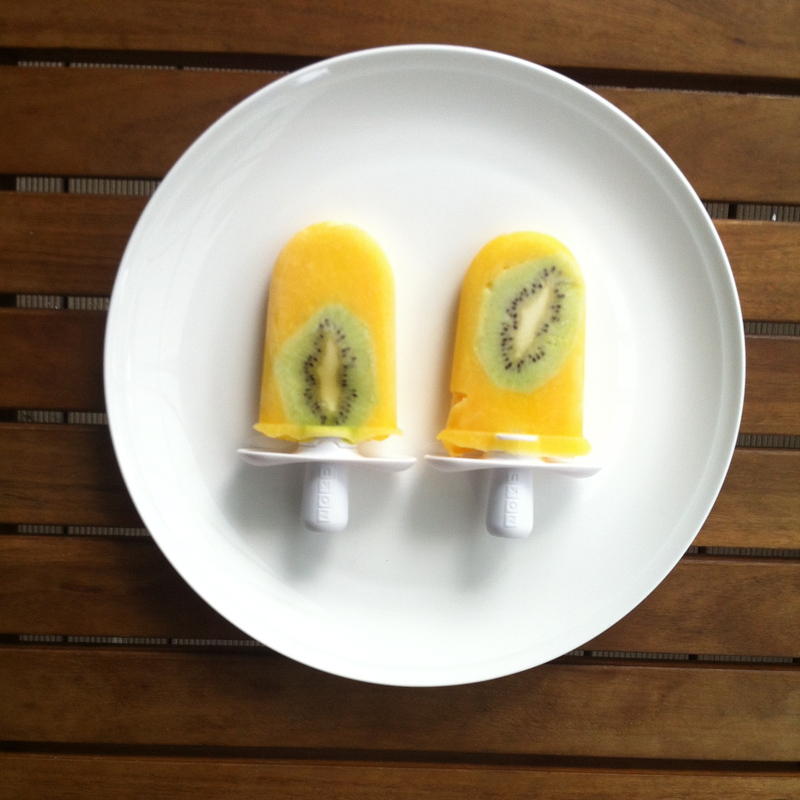 This entry was posted in Nutrition, Recipe and tagged dairyfree, glutenfree, iceblock, icepop, kiwi, kiwifruit, orange, orangejuice, rawvegan, refinedsugarfree, vegan by 6 Clean Ingredients. Bookmark the permalink.